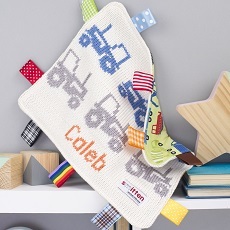 Contemporary handmade baby comforter with a knitted front featuring a taupe and royal blue tractors motif, backed in carefully selected fabric printed with brightly coloured vehicles and edged in a variety of textured ribbon tags. The greatest care goes into selecting all components of Smitten products. The woven fabric chosen to back this knitted baby comforter has been handpicked to compliment the motif design and luscious yarn colours shown on the front. The combination of textures used to create this comfort blanket provide a range of tactile experiences for little hands to explore, encouraging interaction and stimulation. Smitten knitted comforters can be customised with a name, initials or date of birth (up to 7 characters) for a unique personalised baby gift. If you would like a personalised comfort blanket please select ‘personalised’ from the drop down menu and enter your required text in the box. Your chosen text will be knitted integrally on the front of the baby comforter in orange. If you would like to customise your comforter with more than 7 characters, please contact us to discuss your requirements. All Smitten comfort blankets are knitted in luxuriously soft ‘Baby Bamboo’ yarn (80% bamboo 20% wool) developed especially for babies by UK based yarn spinner, Sirdar. The wool content adds warmth to the yarn whilst the eco friendly bamboo fibres give it a super soft and gentle handle. Perfect for snuggling against babies’ skin. All Smitten comfort blankets can be machine washed on a wool cycle up to 40 degrees. Iron if necessary on the reverse woven side.